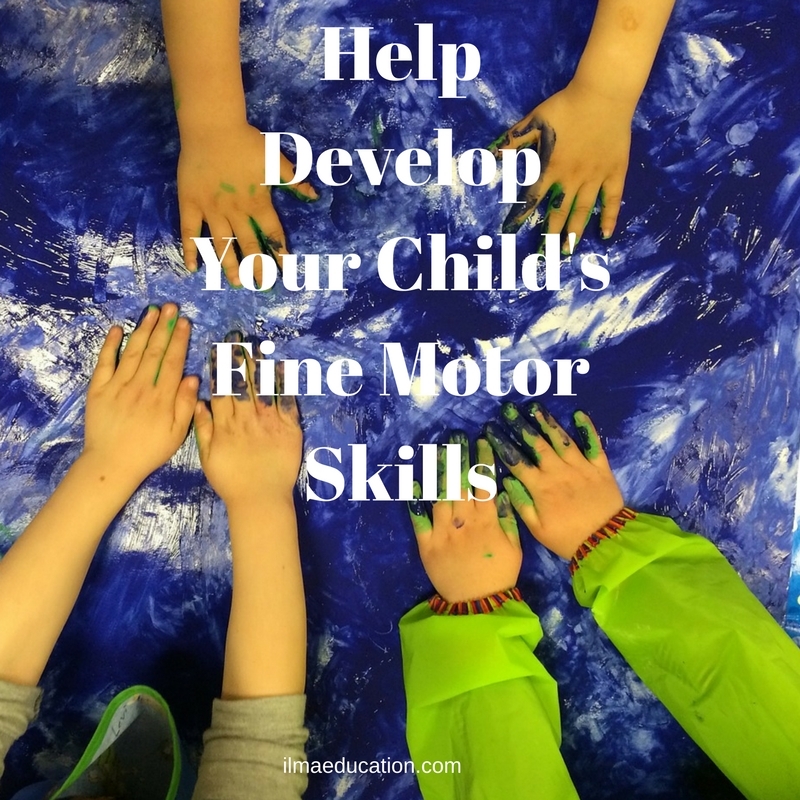 There are many ways to help your child develop her fine motor skills. At ILMA Education, children do a lot of cutting, sticking, painting, writing/tracing, drawing, colouring, and playing with playdough, manipulatives and small toys. They do these activities everyday not once in a while. The key is to provide your child with constant practice. Have scissors, paints, markers, stickers and any other craft items available for your child. The more she fiddle around with theem then the better will be her fine motor skills. Provide your child with a pair of child size scissors. Make sure that they can actually cut. There is nothing more frustrating to a child then cutting with a blunt pair of scissors. Trust me, I know. A long time ago, I bought these plastic scissors with plastic blades and they just don't cut. They might be safe to use because they're not sharp and don't cut fingers but they don't cut paper either. So it's really important to make sure that the scissors you give to your child does cut. If you worry about your child hurting herself then of course, supervise her for the first few times. Show her how to hold the scissors and move her fingers. This does take a while but with constant practice, your child will be able to control it soon and need less supervision. The photo above shows a 2.5 year old child holding a pair of scissors for the first time. This was at the beginning of the year when she first attended ILMA. She was so fascinated and from then on every time she came she always asked for the scissors. The bottom photo shows her at mastery level, she could now follow any line even curved ones. This took her 5 months of practice cutting every week (she only attended once a week in the toddler class). Provide your child with a glue stick and lots of things to stick - paper, craft items and stickers. What child does not love stickers? If you give your child a full sheet of small stickers that she can peel off herself then this is even better. Peeling off small stickers and positioning them onto a piece of paper will surely test her fine motor skills. Besides, it's a fun activity that your child will enjoy. Most children love to paint (with the exception of children who are extremely clean and don't like to get their hands dirty!) so painting is a fun activity that they will enjoy doing without realising that they're practising a skill. To make it fun and interesting, you could vary the type of paint, the type of paper or canvas your child will paint on or the type of implement to paint with. You could try acrylic paints, water paints, water colour pencils, finger paint, thin bruches, thick brushes, rollers, cotton tips (or Q-tips) for dot painting, or even cars, strings and marbles to make different types of tracks. The main aim of having fine motor control is for children to be able to hold a pencil and write. So put different types of writing implements into your child's hand and let her scribble away to her hearts content. There are colour pencils, metalic pencils, crayons and pencil crayons, markers, stampers, colour changing markers, glitter pens, glitter glue pens, and fluoro pens. Then there are different types of papers to scribble on: white boards, chalk boards, magnetic writing pads, colouring books and tracing books. I'm sure there are more things out there waiting for your child to make marks with and upon. Go find them and put them into your child's hand. Playdough is great to develop fine motor shills because your child can use her fingers and hands to roll, knead, squash, pat, pinch, poke and a whole lot more. At one time, I'd even made glitter playdough. It just so happened that on a previous day, one of the prekindy classes made a glittery G. And of course, the tables were full of glitter. I didn't want to waste it so I took some new playdough out and rolled them over the glitter. It collected all the glitter better than if I had wiped the table. I kneaded the playdough to mix the glitter in and voila I had glitter playdough. The children loved it. Anything that your child can pick up and hold in her little fingers is a great activity for fine motor control. There's no limit but just make sure that it's safe to play with! These are a few ways to help your child develop her fine motor skills. Remember to practice them every day. Your child won't know that it's work because they're all so much fun to do. To read more on developing fine motor skills, click on 'fine motor skills' and 'scissor skills' under the Category heading below on your left. I've written on this topic before so go ahead and explore.